Once the weekend comes around it’s the perfect excuse for wearing more casual outfits and therefore more casual shoes. Whether you’re heading out with the kids or off to football with the lads you’re going to want to be comfy. Team your favourite jeans with some lace up canvas shoes; choose a navy or burgundy version to give your outfit a pop of colour. If the weather isn’t great then fear not swap your canvas shoes for some lace up ankle boots and baggy jeans, for all you fashion conscious guys out there this gives your outfit a high fashion twist. Good old trainers are a match made in heaven for your trusty jeans, if you have a busy day planned then having comfy footwear is absolutely essential, choose some slip on trainers to give your outfit a casual, sleek look, these are perfect for those days spent on your feet. 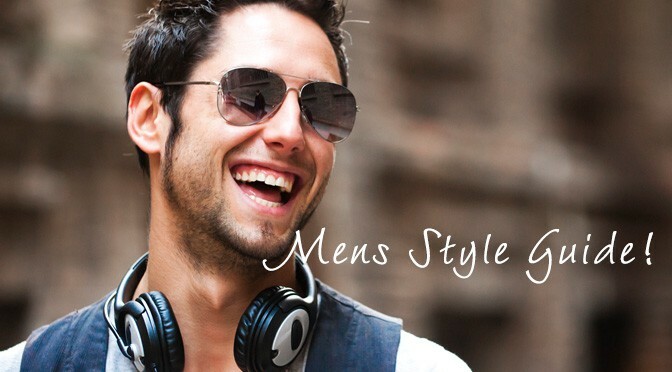 Skinny jeans are a wardrobe staple that never really go out of fashion and with so many different styles and colours to choose from it can be a bit of a chore deciding which shoes to wear. For dark blue or black skinny jeans choose some slip on, square toe shoes, by adding some bright funky socks and a blazer you have a classic vintage look that’s bang on trend. Swapping your dark jeans for a brighter colour and adding some slip on shoes in a distressed tan, not only gives your outfit more of a relaxed look but it also adds interesting vintage detail. If jeans are not your thing then chinos or khakis are a great alternative, choose some stylish desert boots in beige, blue or green to wear with them for a classic look that’s perfect for a relaxed dinner date. Smarten them up by pairing them with a classic brogue shoe, brown will add a softer touch that’s less formal than black. Come the Summer, three quarter length chinos will see you through those parties and BBQ’s with family and friends, simply add a pair of slip on canvas shoes for a chilled out look. When Spring arrives the weather can still catch us off guard. When the rain hits the obvious choice to go to is wellies, adding a classic pair of green wellington’s to your off duty look of jeans and chunky knit can give your outfit a fashionable yet practical twist, don’t forget the trusty parka to keep you super warm! A pair of Chelsea boots or zip up ankle boots will work just as well if the heavens open while you’re enjoying an evening out. Team a pair of jeans with any of these boots for a smart-casual look. When Summer finally makes an appearance and the temperatures rise we know you want more of a relaxed look so what shoes should you wear to keep you cool? Style your favourite shorts with some sporty or toe-post sandals which are perfect for those days having fun on the beach or why not pop a pair in your case if you’re jetting off on holiday. If you’re heading to the park for a kick around then some lightweight trainers will be perfect, light and airy these will do a great job of keeping feet cool as well as comfy. For a smarter casual look simply wear some stylish lace up canvas shoes, these can be worn with or without socks. If you’re one of the lucky ones that manages to get to a music festival then make sure you pack wellies! A pair of trusty wellies are going to be your new best friend, wear with shorts or jeans for a festival ready look this summer. Sometimes in life looking and dressing smart is essential. 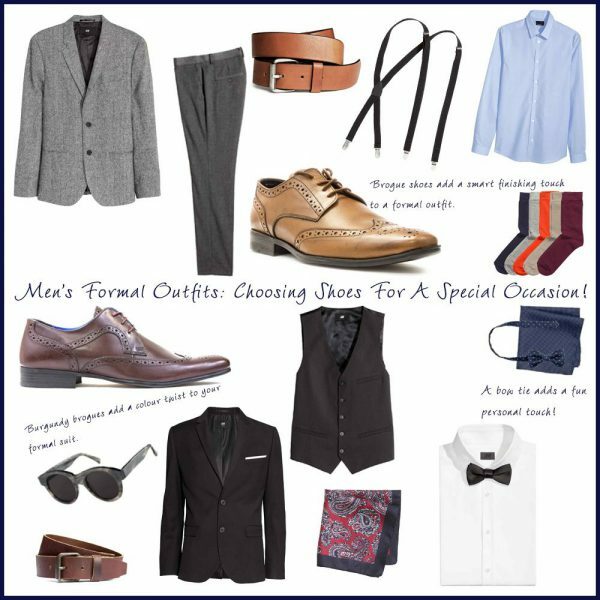 If you have an all-important wedding or night out coming up and you’re struggling to decide on what to wear, why not make things easier and dress from the feet upwards. Nothing screams smart more than a sharp tailored suit; choose a stylish pair of brogues in black or brown with classic brogue detailing to go with it. 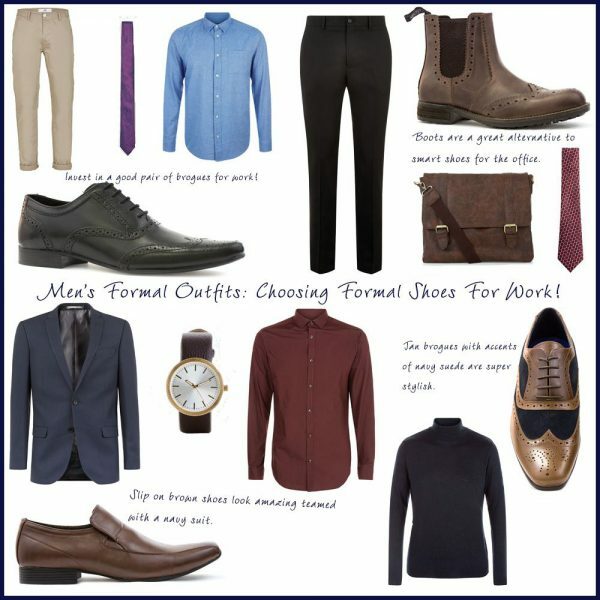 Why not branch out from the usual black and choose a navy or burgundy suit, these colours look amazing with tan shoes so pick out some sleep slip on smart shoes, with many including eye-catching stitch detailing they are the best shoes for adding that final flourish to a special occasion outfit. For a city wedding look or again after work drinks smart grey trouser and a linen shirt look amazing with a pair of lace up shoes, it’s a relaxed look that still looks incredibly put together and smart. Nowadays weddings can be a less formal affair, if that’s the case and you’re heading to a beach wedding then a pair of smart sandals are for you, wear with a short sleeved shirt and smart shorts for a real beachy look. 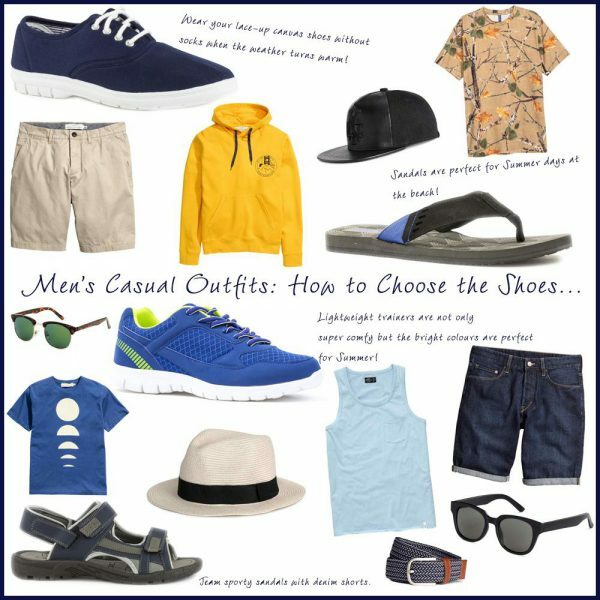 If sandals are not your thing then swap replace with some smart canvas shoes (don’t forget they can be worn without socks)! The lace up canvas style can be dressed up for those formal occasions for example why not swap the colours of the laces over. Dressing smart for work not only helps you make a good impression it can also help you feel more confident in yourself. Every man’s working wardrobe should have a pair of classic brogue shoes; they really are an investment piece. These detailed and elegant shoes add that sleek final touch to your office look. Wearing smart shoes doesn’t mean you have to go with a pair of lace up shoes. For work a good pair of brown slip on shoes works just as well, style with navy trousers and a white shirt for a formal look with a difference, choosing a pair with interesting detailing such as the stitching or finish can really add a modern twist to a relatively plain outfit. Add a nod to the vintage trend that just doesn’t go away in a pair of distressed brown slip on shoes; wear a matching belt to keep things coordinated. You don’t always have to wear shoes to rock a formal look at work a good pair of smart Chelsea boots work just as well, pair with a tailored suit for a classic high fashion look and mix things up by choosing heeled or flat versions, both work well to achieve the look you want. Black Jeans are so versatile they will go with every colour shoe you have. White adds a clean summery touch while burgundy, blue and green really pop against the black. Black shoes with black jeans do tend to get lost however it is a classic “rock star” combination that never goes out of fashion. Navy Suits really are a gorgeous alternative to boring old black, there is something fresh and modern about them. Tan and deep brown shoes look amazing teamed with navy and really add a high fashion touch to your look. For a cool colour clashing look style a rich burgundy shoe with a navy suit and watch the compliments come in. Grey Suits are just so sophisticated and sharp, a good black pair of shoes give the whole look a classic feel however branching out into browns, blues and greens brings the look right up to date and a light grey will really help these colours stand out. Jeans can really be worn with any colour. Dark denim again looks amazing with tan and brown shoes while white really adds a modern twist that will appeal to the younger generation. Black, burgundy and navy shoes look fantastic against lighter denim, making the colours pop. Little accents of colour often bring more to your outfit than full on colour; why not swap the laces in your shoes to a brighter, quirky colour. Red against brown is a match made in heaven. Or adding neon laces into your white lace up trainers gives them a cool, festival ready touch. A lot of smart men’s shoes now come with a different colour sole meaning you get a flash of colour when you walk, how cool is that! So there you have it, who says picking the right shoes has to be difficult? With amazing styles available for smart and casual looks in a whole range of colours it’s time to mix up your look and try new things. 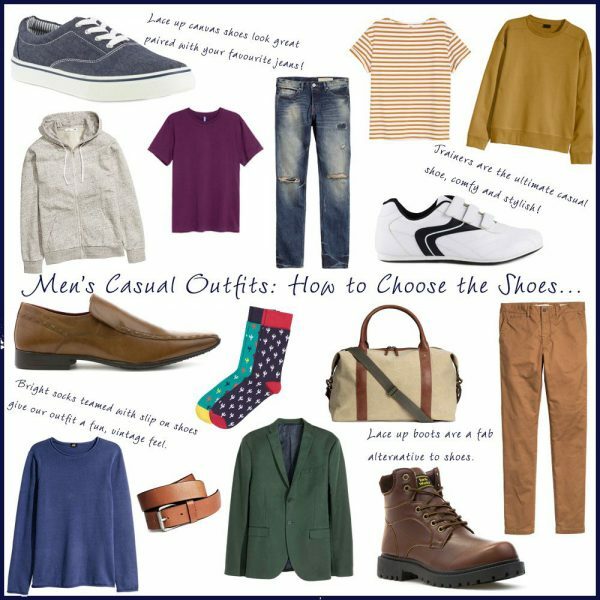 Always try and remember to choose your shoes first and work your outfit around them to make dressing casual or smart that little bit easier.